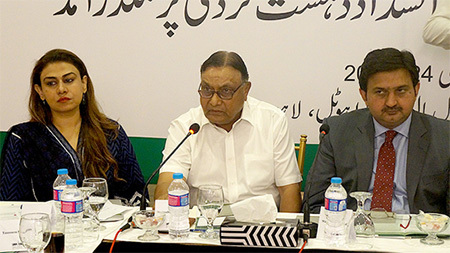 May 24: Punjab Government is committed to speedy & effective implementation of the National Action Plan, said Malik Muhammad Ahmed Khan, Spokesperson & Adviser to Chief Minister Punjab on Information & Culture while speaking at PILDAT’s Public Forum on Implementation of NAP. 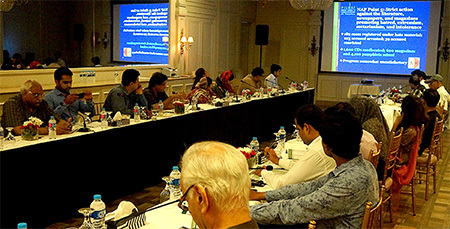 Appreciating PILDAT’s role as to monitor implementation of NAP from citizens’ perspective, Mr. Khan said that the Punjab Government remains committed not just to effective implementation of NAP but also reporting on its progress which led to the Government sharing data with PILDAT on the status of implementation in the first two years. He stressed on the difficult nature of modern day terrorism and held that the Punjab Government is making strides particularly in the area of forensics and surveillance. He also brought attention to the Punjab Safe Cities Authority and highlighted its role in increasing the Government’s power of surveillance. He expressed his confidence in the fight against terrorism with the launch of Operation Radd-ul-Fassad and said that intelligence sharing at the provincial level has increased since. However, Mr. Khan was of the view that revamping of the criminal justice system would take at least ten years with sustained and concerted effort. Members of PILDAT’s Steering Committee on the Implementation of National Action Plan, Dr. Noel Israel Khokar, Mr. Tasneem Noorani, Mr. Mujeeb-ur-Rahman Shami, and Lt. Gen. Retd. 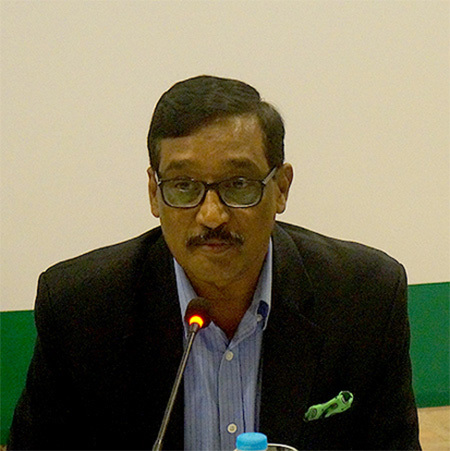 Moinuddin Haider, also spoke on the occasion. Dr. Noel Israel Khokhar, Executive Dean Forman Christian College, thanked the Punjab Government for willingly sharing data with PILDAT and candidly participating in discussions on implementation progress of NAP. He explained that PILDAT’s Monitor on Implementation of NAP to Counter Terrorism was a citizens’ initiative to help Federal and Provincial Governments in assessing their performance. The PILDAT’s Monitor on Implementation of NAP should therefore be taken by Governments as indicator of where the pace of progress requires improvement. Dr. Khokhar also highlighted that tangible progress on NAP would only be visible if uniform progress is achieved on all 20-NAP Points across Federal and Provincial Governments. 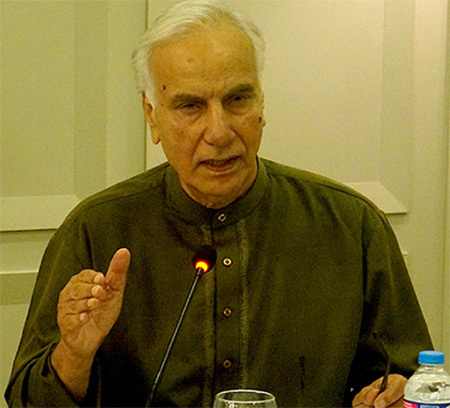 Mr. Tasneem Noorani, former Federal Secretary Interior, appreciated PILDAT’s methodical overview of the status of implementation of NAP while he believed that the analysis shows the overall implementation on NAP has not been satisfactory. He highlighted the case of military courts in which according to him the appeals pending before the High Courts and the Supreme Courts called to doubt their efficacy. Mr. Noorani also mentioned the case of ineffective checking of terrorist financing in which he said that committees constituted for the purpose should work on addressing the lacunas present in the area. Mr. Mujeeb-ur-Rahman Shami, senior analyst and Editor-in-Chief Daily Pakistan, said that PILDAT’s Monitor on Implementation of National Action Plan has made work easy for the Governments, Legislatures and Citizens to review progress on a crucial roadmap. He believed reforms in criminal justice system to be most crucial element in success of NAP. He also said that a clear strategy should be adopted in dealing with members of organizations that are proscribed. Lt. Gen. Retd. Moinuddin Haider highlighted the gains achieved through military operations particularly in establishing the writ of the Government in areas which were previously hit by terrorism. He was of the view that criminal justice system reform is essential and the re-housing of internally displaced persons was an important aspect of NAP. However, he expressed his disappointment on the status of implementation of FATA reforms and said that work on it was stopped at the eleventh hour due to the reservations of certain political leaders. Earlier while providing an overview of PILDAT Public Forum, Ms. Aasiya Riaz, Joint Director PILDAT, shared that PILDAT’s initiative of Monitoring Status of Implementation of NAP was a citizens’ initiative. The 20-point NAP is the most important road map for the struggle against terrorism in the country. The NAP is also significant because it has the rare consensus of otherwise bitterly opposed political forces besides the civil-military agreement. Despite this assigned centrality to its importance, Federal and Provincial Governments have not regularly made available a progress status on the implementation of the NAP. It is in view of the high importance of the NAP and questions about its progress of implementation that PILDAT has undertaken a citizens’ initiative to monitor the progress of implementation of the NAP at the national and provincial levels. By undertaking the monitoring of the progress on implementation of the NAP and its public dissemination, PILDAT initiative aims to serve the purpose of advocacy for effective implementation. Ms. Riaz stated that owing to lack of complete data received from all entities, PILDAT has released an interim monitor that contains the working data for national and provincial progress. The Interim Monitor has been termed ‘Interim’ as data on many parameters in this Monitor is incomplete, especially for provinces except Punjab. Since the Punjab Government has shared the most comprehensive data, a Monitor focusing on implementation status on NAP in Punjab has been released by PILDAT using the traffic light assessment (Green, Green-Amber, Amber-Red, Red). Sharing the overall assessment, Ms. Riaz said that the status of implementation of National Action Plan from January 2015 – December 2016 shows that only three NAP points received Good or Very Good (Green) progress rating; three other points received Satisfactory (Green-Amber) progress; progress on 4 Points is outright unsatisfactory (Red) whereas 10 points indicate somewhat unsatisfactory (Amber-Red) progress in PILDAT’s assessment. PILDAT’s public forum on implementation of NAP comprising of media persons, academics, and students. PILDAT Monitor on Implementation of NAP to Counter Terrorism in Punjab [English Version]can be accessed here. PILDAT Monitor on Implementation of NAP to Counter Terrorism in Punjab [Urdu Version]can be accessed here. PILDAT Background Paper on Implementation and Monitoring of the National Action Plan can be accessed here. PILDAT Interim Monitor on Implementation of NAP to Counter Terrorism can be accessed here .